I had spent the morning touring past priceless works of art at the Van Gogh Museum and Rijksmuseum and decided to walk to the Hotel Amstel for Afternoon Tea. The distance was about 1.4 km or just under a mile, and even though it was a cool January day, it was clear, bright and just begging for a brisk afternoon walk. Starting out from the Museumpleine , I headed east toward the Amstel Hotel. Along the way, I began to think that I had gotten off my directions, so I stopped in an office building and asked the receptionist if I was on the right track. She entered my information into her iPhone and quickly determined that I was one street off, but running parallel to the correct street, so I would still encounter the hotel, just from the other side. 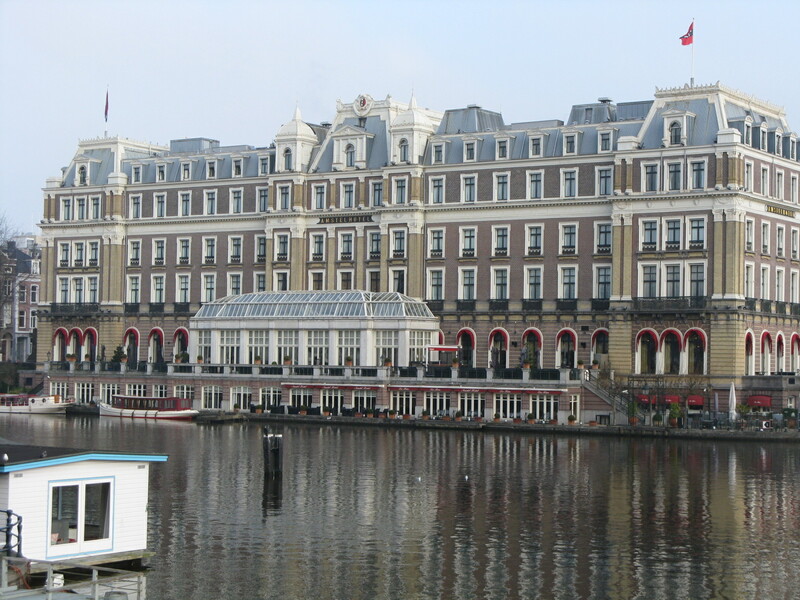 As I came up to the Amstel River bridge, I couldn’t miss the grand façade of the Amstel Hotel, located just across the river on the opposite bank. 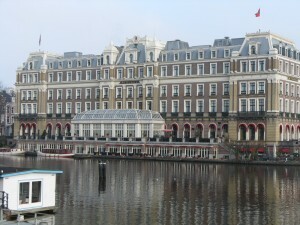 Dating from 1867, this is one of the premier hotels in Amsterdam. Previous guests have included Queen Elizabeth, Gustav Eiffel, Audrey Hepburn, The Rolling Stones, Elizabeth Hurley, and U2. Afternoon tea is served in a very unique room called the Amstel Bar and Brasserie. 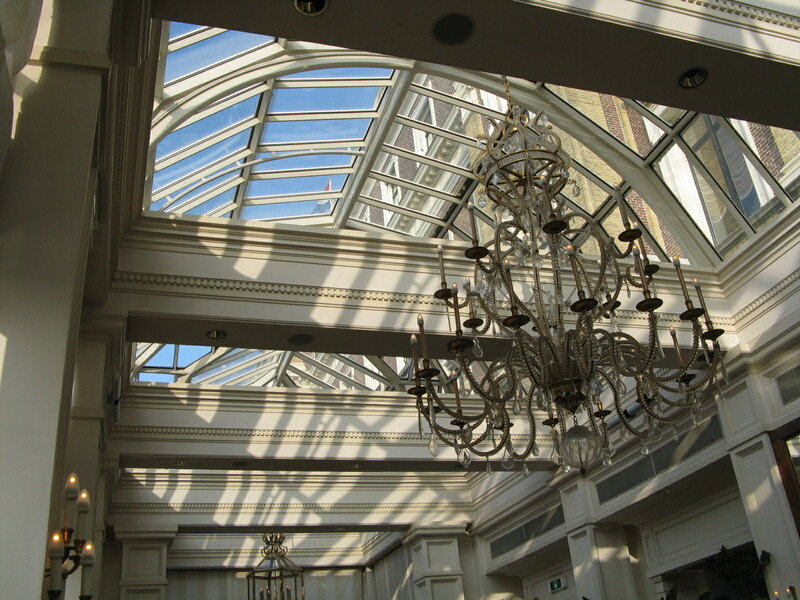 It’s a glass enclosed space with natural light pouring in from every conceivable direction – the exterior reminds me of an elegant greenhouse with a clear-glass roof and floor to ceiling side windows. Located just next to the Amstel River, it’s an informal, but smartly appointed room with views of passing boat traffic and historic Amsterdam bridges. A full bar menu is available with food inspired by French brasserie cuisine. Examples include Breton oysters, baguette with crème fraiche and smoked salmon, mini croquettes, etc. The staff informed me that I could sit wherever I wanted, so I chose a table right next to the windows overlooking the river. 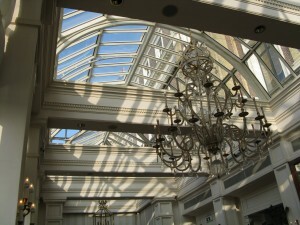 The brightly lit room is very inviting and its openness lifts your spirits. If you’re looking for an “afternoon tea” section on the menu, you won’t find it. Rather, everything is a la carte, so if you want to have afternoon tea, first choose one of the six premium teas (Tong-Ting Oolong, Formosa Superior Oolong, Japan Original Genmaicha, Darjeeling Summer Flush, China Lung Ching, or China Finest Jasmine). Then you will choose the food accompaniment, which in this case would be the assorted sandwiches and scones with clotted cream and confiture. On the menu, the assorted sandwiches are called Pain Surprise (pan soo-preez). I didn’t quite know what to make of that, but the staff guided me to this entry for afternoon tea. More on that below. At the risk of repeating myself, the ambience of this room is really stunning – the floor to ceiling windows facing the river allow natural light to come in and also permit you to see the activity along the water and the nearby streets of Amsterdam. 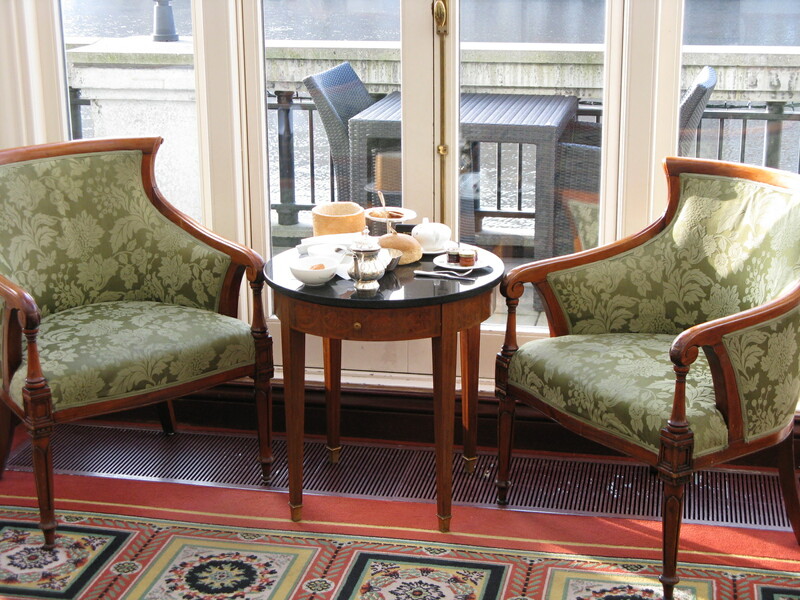 It is really a pleasant atmosphere to have afternoon tea or just spend time in some other way – of course, none of this would be possible if the hotel hadn’t chosen this desirable riverfront location in 1867. To my right me was a mother with her two adult daughters and further ahead was a businessman thoroughly engrossed in his work. None of us was in any hurry this day and all was right with the world. Eventually, a staff member appears with something you have probably never seen before. 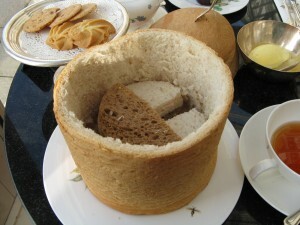 On a serving tray will be a large, silo-like, hollowed out, molded bread crust with a removable top, and the staff member will say, “Here is your surprise.” In my case, it truly was a surprise as I could not imagine what it was, since I was the first person that had ordered afternoon tea that day. When the server removes the top, your tea sandwiches are revealed inside – egg salad with watercress, smoked chicken, smoked salmon and cucumber. The freshly prepared sandwiches are excellent with the egg salad and cucumber sandwiches being very cool and crisp. The smokiness of the chicken also added a distinctive flair. And what would an afternoon tea be without scones? Here, the lemon and vanilla flavored scones were served with a rich, yellow clotted cream and were very good. This was a wonderful introduction to Dutch-style afternoon tea, a pleasant and relaxing experience in a beautiful room with magnificent views of Amsterdam’s famous canals and bridges – with a Formosa Oolong and a “soo-preez” that I will not soon forget. 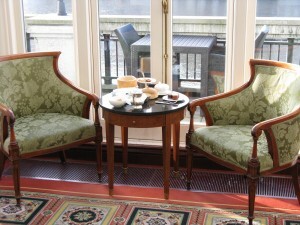 This entry was posted in European Teas and tagged afternoon tea, amstel hotel, amstel inter continental hotel, amsterdam, high tea, netherlands. Bookmark the permalink.